When I saw the Time Magazine article last week, “Food Waste is Ripe for Profit,” I knew I had to write this post. The the article talks about the alarming amount of food waste in America. There is so much waste from the way we create -grow- transport -use & discard food in this country. We need to re-think every step of the equation. Which led me to think, MAKE STOCK NOT TRASH. 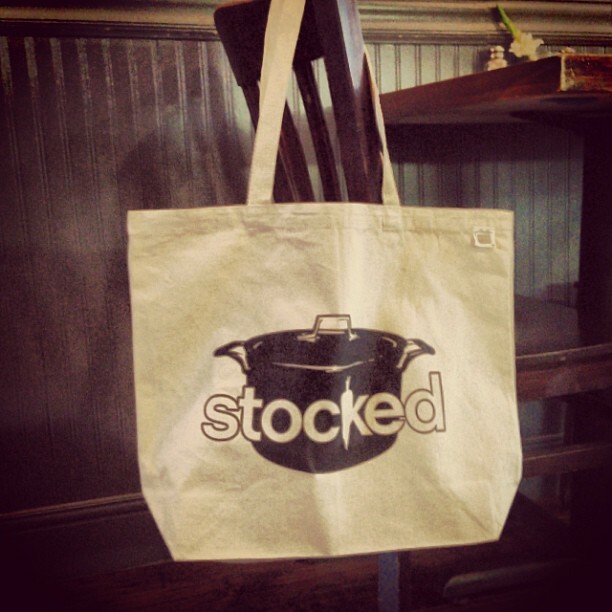 I bet the concept of “taking stock” came from the age old practice of MAKING STOCK! While I haven’t wiki’ed this – I know it must be tied to understanding and using the value of something for as long as possible. In our house we love to cook and we are always working on a zero waste household commitment. We make our own “stock” all the time. If we roast a chicken, all the bones go in a pot, with the left over veggies and scraps that weren’t used in the meal, to make a savory stock. Last week we peeled apples for a crisp and the apple peels went into the stock pot. Don’t eat meat? You can make a great stock with veggie & herbs. Don’t over think this. Every kind of basic food (nothing processed) can make an appearance in the stock pot. This holiday season, take stock of the abundance you have and MAKE STOCK NOT TRASH! You’ll find out how yummy it can be. Note: Time used our Classic String Bag to hold the food waste in the article (YEA!) instead of using a throw away plastic bag. That says something in and of itself!